Shining continue to thrill with their latest studio LP, even if their playbook is more predictable this time around. The site is laced with enigmatic clues, a clever if obvious artifice that helps drape the International Blackjazz Society in an alluring secrecy. (Of the numbers "1375", the main refrain on Blackjazz's "Fisheye", the site intones: "At the moment nothing more can be disclosed about 1375.") On its own, Blackjazz is one of the great metal achievements of the 21st century; nothing needed to be added to it in order to ensure its perpetuity. Now that blackjazz has become a moving target, however, Shining have by extension posed an obvious question: what is blackjazz, exactly? Had Blackjazz as an appellation only existed on that 2010 album, its definition would have been reasonably straightforward. On that LP, to date Shining's masterpiece, the rugged intensity of metal is merged with the comfort in chaos that is a central component of free jazz. Blackjazz is the result of throwing a couple of Dillinger Escape Plan albums, some old Mingus LPs, and In the Court of the Crimson King into a blender, and the result is nothing short of stunning. One One One keeps Blackjazz's ethos -- the groove and punch of metal with the free play of jazz -- but refines it, letting each song be expressive of only one or two main ideas. Blackjazz has cuts like "HEALTER SKELTER" and "Exit Sun", both of which explore the space of the album as much as possible. One One One's strongest moments, such as lead single "I Won't Forget", stick to the verse/chorus format, all the while remembering to throw in some sax skronks in when necessary. International Blackjazz Society continues on the path laid out by One One One. These nine tracks collectively run only four minutes longer than the latter LP; two of these songs are brief introductory or interstitial pieces ("Admittance" and "Church of Endurance"). The choruses are unambiguously in the forefront, even when virtuosic instrumentation starts to overtake the spotlight, as on "Thousand Eyes", where new drummer Tobias Ørnes Andersen gets to flex his chops in a drum solo, a rare move for Shining. The loss of former drummer Torstein Lofthus, whose presence is integral to Blackjazz's success, is no doubt a significant one for Shining, but Andersen proves up to the task. Here he lays down rock-solid rhythmic designs while also taking moments here and there to show off. It's called blackjazz, after all. On most accounts, International Blackjazz Society excites in the same way One One One does. Boot-stomping riffs ("Burn it All" and "Thousand Eyes") are bound to bludgeon themselves into listeners' memories. Rollicking, almost bluesy numbers like "Last Day" show just how amenable jazz is to the verse/chorus rock structure -- in Shining's capable hands, that is. The hectic gallop of "Need" is indicative of Shining's ever-impressive ability to let chaos flow freely, all the while keeping things tethered to an identifiable rhythmic core. Like the material on One One One, International Blackjazz Society's tunes borrow heavily from industrial music, with jagged distortion and screeching synthesizer riffs aplenty. In all these ways and many more, Industrial Blackjazz Society is an apt capture of Shining's aesthetic following Blackjazz. It's a solid addition to a mercurial discography rich in experimentation. However, unlike most Shining records of the past, International Blackjazz Society is a further distillation of what came before it, rather than a significant creative leap. The sounds of One One One are similar to what is heard on Blackjazz; likewise, the seeds of Blackjazz were definitely present in the fertile soil of 2007's Grindstone. While the distinction between One One One and Blackjazz is primarily structural, not sonic (accessible pop in the former and lengthier prog in the latter)International Blackjazz Society's relationship to its predecessor is one of slight degree rather than significant margin. Put simply: whereas risk has been a defining feature of Shining in the past, here the band is getting closer to turning on autopilot. Some critics might disagree with this claim; in fact, some already have. In his positive review of International Blackjazz Society for Pitchfork, Brad Nelson argues that the free jazz of "House of Warship" is "actually kind of new territory for Shining; even their freest moments on previous records seemed premeditated, a kind of organized collapse." Never minding the presence of free jazz on both Grindstone and 2005's In the Kingdom of Kitsch You Will Be a Monster, Nelson's broad generalization about the "premeditated" aspect of Shining's earlier music fails to account for Blackjazz's "HEALTER SKELTER", to this day the exemplary case of Shining at their most unhinged. "House of Warship" is similarly daunting in the way it expands on repetitive riffs, but for that same reason it also feels quite familiar. Up until International Blackjazz Society, tracking Shining's career has meant resigning oneself to constant surprise. The word "pop" seemed an unlikely one to ever be a major player in the Shining aesthetic, but lo and behold, One One One exists. International Blackjazz Society checks off all the boxes, and does so in a zero-to-60 acceleration that makes for a headbangin' good time. Yet for every thrill, there's a nice if overly comfortable pang of the familiar. Still, what counts as "familiar" for Shining is far more exciting than most other attempts at innovation in metal at the moment, to say nothing of other musical genres. 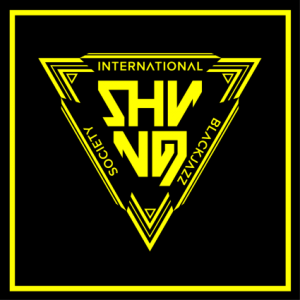 In the grand scheme of Shining's output, International Blackjazz Society is a lesser moment only because it innovates in a less distinct way than its predecessors. Nevertheless, it is not a lesser album -- far from it. The fact that Shining have set such a high bar for themselves to vault is a testament to their musical talent and capaciousness, features that are in full display on International Blackjazz Society. Two things are certain by the time these nine songs come to a close: Shining are still figuring out what exactly "blackjazz" is, which means for the rest of us that a thrilling ride is still in order.